The Saskatchewan Roughriders haven't hosted a home playoff game since 2013, but they are firmly in control of changing that. 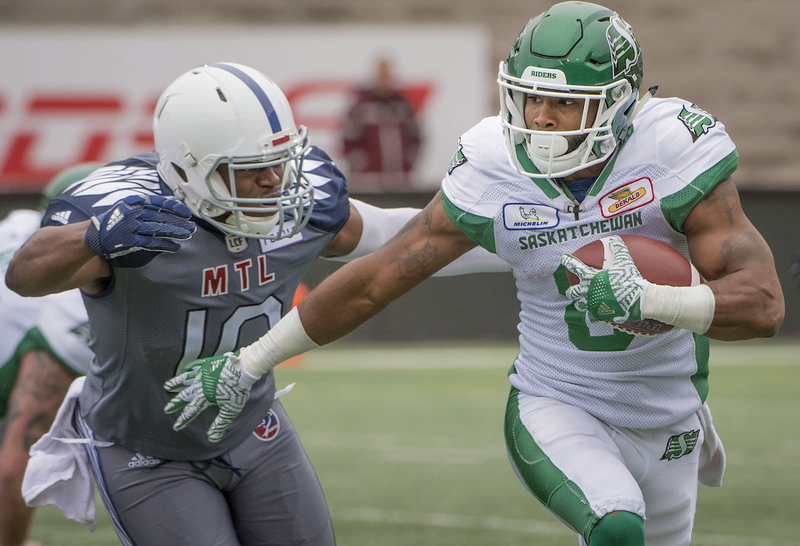 The Riders earned a 34-29 home win Sunday over the Montreal Alouettes. That left Saskatchewan (9-5) second in the West Division standings, four points behind first-place Calgary (11-2) but four points ahead of both Edmonton (7-7) and Winnipeg (7-7). What's more, Saskatchewan's four remaining regular-season games are within the West Division, playing each squad once down the stretch. That begins Monday with hosting Edmonton, which lost 30-3 at home Saturday night to Winnipeg. The Riders' last home playoff game was a memorable one. They defeated Calgary 35-13 in the West Division final before dispatching the Hamilton Tiger-Cats 45-23 in the Grey Cup game, which was also in Regina. Saskatchewan finds itself on a nice roll, having won six of its last seven games since quarterback Zach Collaros's return under centre. On Sunday, Collaros threw for 394 yards with a TD and interception. The 300-yard performance was Collaros's first this season. "I could care less about 300-yard games,'' Collaros said. "The arbitrary number of 300 means absolutely nothing. Saskatchewan acquired Collaros from Hamilton prior to the '18 season and signed him to a restructured, one-year deal. Collaros had lost his final 12 starts with the Ticats - one short of the league record - but ended that dubious stretch by leading the Riders to a season-opening 27-19 win over Toronto on June 15. Edmonton and Saskatchewan have met already this season, the Eskimos taking a 26-19 decision Aug. 2 at Commonwealth Stadium. "All you've got to do is look at the standings and see how important it is,'' Chris Jones, the Riders head coach/GM, said of Monday's showdown with Edmonton. "Our goal is to win the Grey Cup and host a playoff game, that's what good teams do. BALL RETURNED: You've got to love Hamilton Tiger-Cats fans. On Saturday afternoon, Ticats safety Mike Daly had a 58-yard interception return TD in Hamilton's 40-10 home win over B.C. It was Daly's first touchdown and in the celebration that ensued, he threw the football into the stands at Tim Hortons field. But the following day, Daly had second thoughts and launched a social-media appeal to find the unidentified fan who was on the receiving end of his jubilant throw. Daly was certainly willing to make it worth the fan's while to return the ball, offering a signed uniform and other items for the momento. Teammate Shamawd Chambers also stepped up, offering a jersey and signed playing cards in exchange for the football. Fortunately for Daly, the fan was identified and located and the two eventually spoke and agreed to an equitable trade. OWENS RELEASED: Chad Owens' second stint with the Hamilton Tiger-Cats ended Monday. The veteran receiver was among four players released by the Ticats. The others were Canadian linebacker Dillon Grondin, defensive back Robert Porter Jr. and receiver/kick-returner Shakeir Ryan, both Americans. Owens, 36, joined Hamilton's practice roster Sept. 11 and suffered an ankle injury in his first workout with the club. The Hawaii native didn't see any game action this time around. Owens spent the '16 season with Hamilton, registering 58 catches for 808 yards and five touchdowns. He appeared in three games in 2017 with Saskatchewan, recording 17 receptions for 225 yards and one TD before being among the Riders' final training-camp cuts this summer. Owens began his CFL career with Montreal in 2009 before being dealt to Toronto. Owens spent five seasons with the Argos, being named the league's top special-teams player (2010) and outstanding player (2012) in addition to helping the club win a Grey Cup ('12). The five-foot-eight, 180-pound Owens has 521 career catches for 6,217 yards and 27 TDs and been named a league all-star three times. He's also recorded 10 career return touchdowns and amassed 16,698 all-purpose yards with 37 TDs. STAMPS' INJURY WOES: The Calgary Stampeders' injury woes at receiver continue. Reggie Begelton suffered a season-ending broken arm in Calgary's 38-16 home win over Toronto on Friday night. Begelton's injury comes with Kamar Jorden (season-ending knee ailment), DaVaris Daniels (collarbone) and Eric Rogers (knee) all sidelined. The good news, though, is Rogers is expected to return soon. Begelton, 25, had registered consecutive games of 150 or more receiving yards prior to being hurt. Still, Calgary (11-2) became the first CFL team to clinch a playoff spot with the win over Toronto. The Stampeders haven't missed the postseason since 2004. WILDER OUT: The Toronto Argonauts will be without running back James Wilder Jr. when they visit the B.C. Lions on Saturday night. JOHNNY FOOTBALL: Johnny Manziel has his first CFL touchdown passes. Manziel threw two TD strikes in Montreal's 34-29 loss Sunday to Saskatchewan. His 47-yard pass to Adarius Bowman in the second quarter put the Alouettes ahead 14-13 before he found Earnest Jackson on a 20-yard TD pass in the fourth that cut the Riders' lead to 31-29. The former Heisman Trophy winner finished 9-of-16 passing for 138 yards and the two TDs while rushing for a team-high 45 yards on five carries. Saskatchewan's defence had five sacks in the contest but Manziel still earned props from veteran Riders cornerback Jovon Johnson. "Manziel is different DIFFERENT!'' he tweeted. "Much respect to that man his pocket awareness and ability to get away from blitzes and pss rushers is unreal! Manziel has completed 54-of-87 passes (62.1 per cent) in four games with Montreal for 622 yards with two TDs and five interceptions. Manziel also has 121 yards rushing on 16 carries but has yet to win as a CFL starter. Notching that first-ever victory won't come easily as Montreal (3-11) hosts league-leading Calgary (11-2) on Monday.